So I picked up the canning hobby a little late in the season. A couple times this August I saw berries on a ridiculous good sale at the store, and it made me realize summer was coming to a close and berries were going with it! I bought lots to blueberries, raspberries and strawberries. Some went into coffee cake, some went in the freezer, and I decided to try to make Jam with the rest. do so much. You have to get your hands dirty (or in this case, very sticky!). Prepare and measure ingredients for recipe. 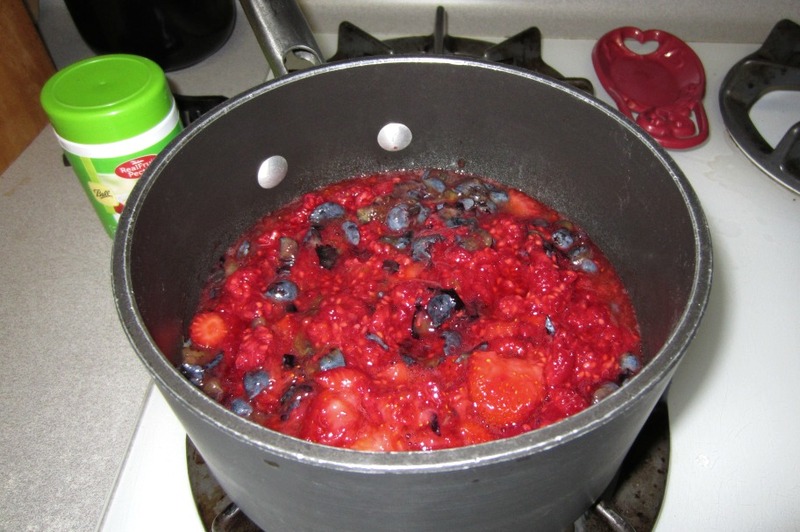 Combine prepared fruit in an 8-quart saucepan. Gradually stir in Ball® RealFruit® Pectin. Bring mixture to a full rolling boil that cannot be stirred down, over high heat, stirring constantly. Ladle hot jelly into hot jars leaving 1/4 inch headspace. Wipe rim. Center lid on jar. Apply band until fit is fingertip tight. The recipe came from the Ball website FreshPreserving.com I used 1 pint of blueberries, 1lb carton of strawberries, & 1 1/2 boxes of raspberries. Jam Taste test: Amazing! Seriously, this work out to just the right combination of berries. Jar #1 is almost gone. I crushed the berries a little bit at a time in a bowl… later I found out you are supposed to a large flat surface (like a pyrex baking dish) and crush them in a single layer. 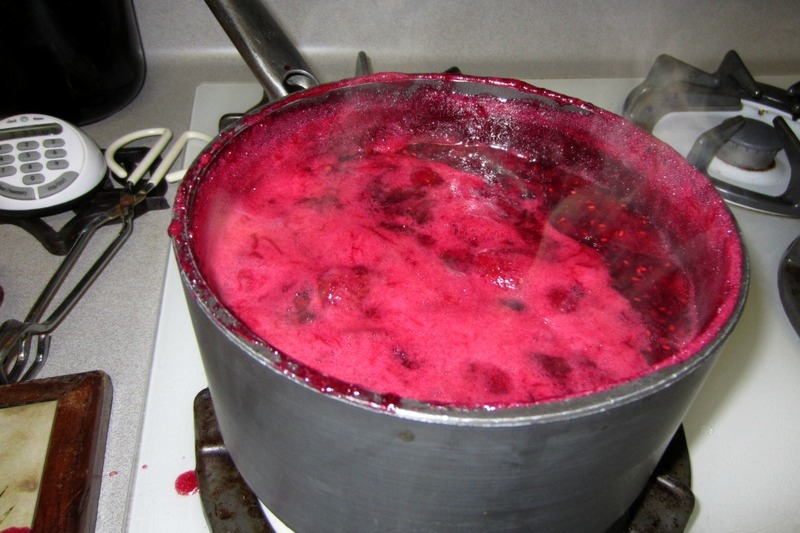 Over crushing with mess up the amount of pectin in the berries, and things wont jell right. The pot I used was medium sized and the jam almost boiled over, oh dear. How did I not visualizes the amount of space 3 pints of boiling jam would need? Next time, use the biggest pot. , of course, but as a general rule it is probably not the smartest thing to do. I washed my jars in the dishwasher with a heat rinse cycle so they were HOT w/o having to boil them. I washed the lids and rings in soapy water and set aside. Didn’t realize simmering the lids was important. Either I forgot or didn’t realize you needed a rack for the bottom of the pot. Oops. This detail is important because it helps the water circulate all around the jars. I used the FROZEN SPOON test and the jam seems to set fine! The recipe called for 6 jars, but I only had enough for 5 (so about 8 oz of jam short). Combine prepared peaches and lemon juice in an 8-quart saucepan. Gradually stir in Ball® RealFruit® Pectin. Bring mixture to a full rolling boil that cannot be stirred down, over high heat, stirring constantly. Peaches were on sale for 99 cents a pound. I thought I was buying 1 pound, but the scale in the produce section must have been off… I ended up worth 5 large peaches, weighing 1.38 pounds. I used the tomato peeling method for getting the skins off, and it worked like a charm! Skins and pits went into the compost bucket. I chopped up the peaches and measured how much it made… what I thought would be a couple cups turned out to be almost 5 cups. So I used the Ball Pectin calculator to figure out the proportions I needed. I went for the REDUCED SUGAR option, because even measuring 3 cups of the stuff into a bowl seems like a ridiculous amount. No wonder jam is delicious! I remembered to put extra jar lids in the bottom of the canning pot (instead of a rack). I FORGOT TO PUT THE JARS IN to heat up before filling. Dumb. DO NOT put cold jars into HOT WATER. I remembered this as I just barely set a jar into the hot waterbath. Luckily I did not have a Mason Jar Explosion. So I wasted a lot of time bring the water back down to cool/luke warm… mainly with ice cubes and ice packs, and dumping some into the kitchen sink to clean some dishes. The taste test was great! And all of the lids sealed fine. But I don’t know if the jam is too stiff… it doesn’t move at all in the jar when I tilt it around. There are several reasons for stiff jam. I think the culprits may be overcooking or too much pectin. What to do with Stiff Jams. Just in case. Combine strawberries, vinegar and lemon juice in a 6- or 8-quart saucepan. Gradually stir in pectin. Bring mixture to a full rolling boil that can not be stirred down, over high heat, stirring constantly. This is actually the 4th recipe I tried to can. I knew I wanted to try it ever since I read the variation to the Traditional Strawberry Jam recipe on the Ball site Freshpreserving.com. My mistake: Not doing the ONE THING you’re supposed to do when you are learning how to can. I went rouge and didn’t follow the Ball approved recipe. After making the Peach Jam that seemed to set up so nicely, I realized that low sugar jams can work. The Ball Pectin calculator gave a strawberry recipe w/ low sugar, but w/o the addition on lemon juice and Balsamic Vinegar. I wanted Balsamic AND low sugar. The thing is, jam making is definitely a science. If there isn’t the right proportion of sugar and acid and pectin, it just wont work. The mixture also has to reach a specific temperature (220°) or it will not jell. I followed the the recipe but reduced the sugar. So after the final boil I tried the frozen sppon test, and it didn’t set. Then I tried the frozen plate test. Then I boiled for another minute and repeated the tests. And then a third time. When it still didn’t seem to set correctly, I decided to just jar it up and process it in the waterbath. Luckily, the resulting “loose jam” is DELICIOUS! It will go perfectly on Angelfood Cake, or ice cream, or french toast. So I am very happy. This batch yielded 5 8oz jars and 3 4oz jars or “Syrup” plus an extra couple ounces that I just put straight in the fridge. 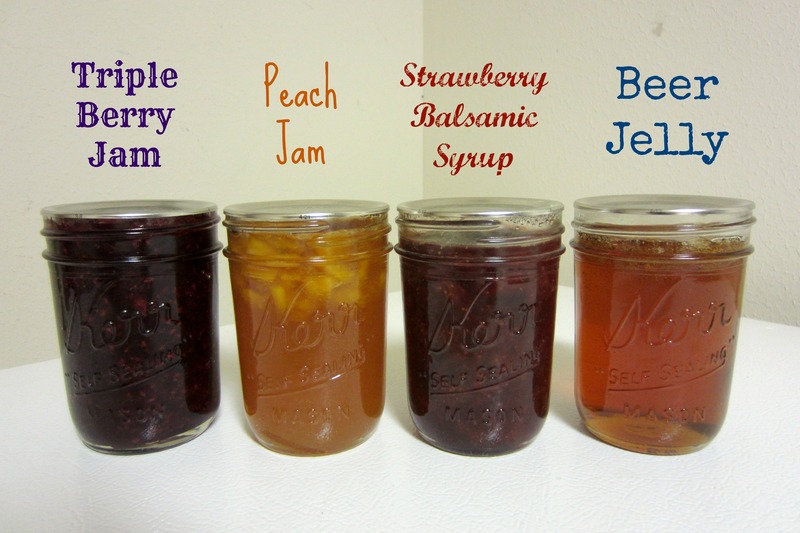 FOOD IN JARS wrote a lovely post on How to tell if your Jam has set. Now I know. Pour Beer into a pitcher to decant. Refrigerate for 24hrs (or until flat). 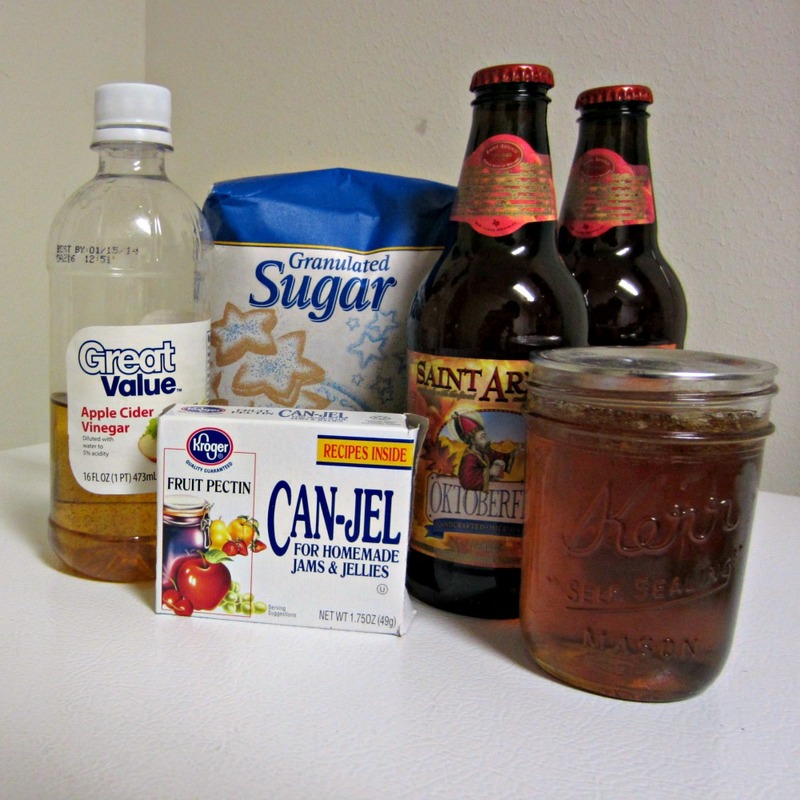 Mix beer, Vinegar, and Pectin in a pan over high heat. Bring mixture to a full rolling boil that cannot be stirred down, stirring constantly. This batch yielded 2 8oz jars and 4 4oz jars… and a few extra oz that went straight in the fridge. Before I tried this, I did a thorough search of the internet to see what exactly I needed to do. 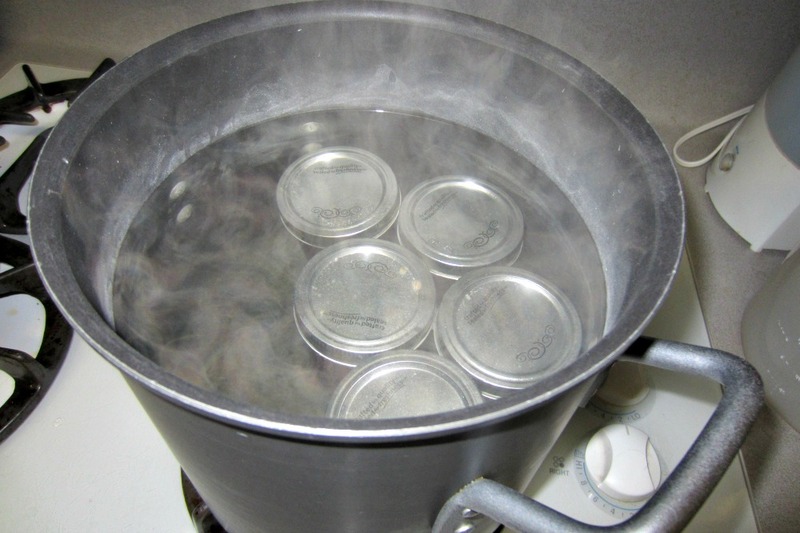 It’s hard to believe there isn’t an official Ball Canning/USDA approved recipe for Beer Jelly. Wine Jelly yes, beer no. I posted a question on SC Canning’s Facebook Page, and her follower Darcie gave me some good Beer Jelly Advice. And it inspired me to use my favorite seasonal beer, St. Arnold Oktoberfest. It is already Fall-Flavorful so I didn’t think adding extra herbs/spices would be necessary. And technically, I do want to preserve the flavor of my favorite beer to enjoy even after the season as passed! That’s what canning is all about. Saving flavor for the future! The only real mistake I made here was not using a large enough pot. I knew the beer would boil up, but I didn’t realize HOW MUCH! I thought it was flat so there wouldn’t be an issue. Wrong. As you can see in the YouTube video below, it goes from simmering to MASSIVE BOILING in a matter of seconds. I turned off the heat before anything boiled over the top, and dumped the hot beer-vinegar-pectin-sugar mixture into our old pressure cooker pot. Somehow I didn’t burn/kill myself in the process. And even THAT huge pot could barely contain the “Hot Break”. Home-brewers are probably laughing at me right now. Sydney Rubin of In A JAM offered some very helpful advice on when I was freaking out that I may have done something wrong. Thus concludes my Canning Adventure for August 2013. I am left with lots of jars of edible (though maybe not perfect) goodness. And the realization that we indeed have Hard Water. But you can wipe down you jars with Distilled White Vinegar and no one will ever know!